The school had been turned down for grant money to buy the expensive pieces of furniture, so the head custodian dug through old student desks cast off in various corners of district storage areas, rebuilt broken parts, and welded on leg extensions. “They’re not the most beautiful things, but they’re super effective, and they give our kids exactly what they needed,” said Lesley Addison, a guidance counselor at the school. 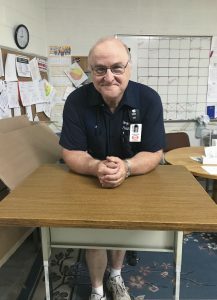 Croschere brought skills as a former union carpenter and a 25-year volunteer Emergency Medical Technician when he started in the district 20 years ago. He approaches his job simply—always looking for ways to help. “If I can do something to make a teacher’s life better or an administrator’s job easier, then I think I’m doing my job,” he said. In the winter, when Addison’s office is cold, he arrives early to open her door and warm up the room. He remodeled a reception area in the front of the building into an office. He’s constantly fixing and building shelves. And he serves on the building’s emergency response team. “He doesn’t make a big deal of it, but he sets a tone that makes other people want to do better because he is such a pillar,” Addison said. As president of his local union, Croschere led a successful fight against privatization plans in the district six years ago. His message: in-house employees give more bang for the buck.